We are delighted to welcome novelist Bruce Wetterau to Omnimystery News today. Bruce's new mystery adventure is Lost Treasure (CreateSpace, December 2012 trade paperback and ebook formats), introducing ex-Army Ranger Clay Cantrell. We recently had a chance to talk to Bruce about his new series. Omnimystery News: Why did you decide to create a series character for Lost Treasure? Bruce Wetterau: Yes, it's first in the series and my first novel too, although I've published nonfiction — reference — books before. I'm a long-time fan of TV detective series and in recent years have gotten hooked on reading series books, like Michael Connelly's Harry Bosch books and Robert B. Parker's Spenser series, as well as historical fiction like Bernard Cornwell's Sharpe series and Patrick O'Brian's Aubrey series. That made deciding to do a series easy, as did the fact that series books are a staple of mystery book publishing. I suppose a big part of the attraction is that you get comfortable with an author and his or her characters. For me it's something like visiting with friends. OMN: The cover of your book calls it a "mystery adventure". Do you think it leans more towards a suspense novel or a thriller? BW: I'm not really sure where the dividing line lies between suspense and thriller novels. So I guess I'd say Lost Treasure is a suspense novel with thriller tendencies. That's probably true of many crime and mystery novels. OMN: How do you see Clay Cantrell developing over the series? BW: Book one establishes Clay and his two friends, Mac and Jimmy, as characters who know how to handle themselves in tough spots, who are adventurous and willing to take matters into their own hands to solve a mystery. But I'm looking forward to having them interact and develop as characters in future books (and I hope my readers are too). The danger with a series, of course, is that the books can become repetitious, stale. Developing Clay and his girlfriend Susan, Mac, and Jimmy as characters as the series progresses will help with that. But I also have plenty of new troubles in mind for them to keep the series fresh from book to book. OMN: Tell us something about Lost Treasure that isn't mentioned in the synopsis. BW: Well, a synopsis has to be short, so you can do only so much. I made sure to lead off with the horde of Confederate gold. It's a key element of the book's appeal — I mean who wouldn't want to stumble onto a treasure worth millions of dollars these days? But the historical subplot centered on the fictional Confederate captain and Supply Depot 21 get a lot more play in the book than you might first think. That's mainly because I wanted to explain why all that gold had been lost in the first place and why it hadn't been found for 150 years. The more I thought about it, the more important the Confederate captain who had charge of the gold became, as well as his perdicament in the last days of the Civil War. I'm not saying the captain's small command post is an allegorical treatment of the last, traumatic days of the Confederacy. Rather I wanted the captain and his men to be subjected to the same pressures — the confusion and growing realization of impending defeat — confronting the Confederacy at the time and then to let them act accordingly. By doing that, the Confederate captain and what he did developed into a major theme, a plot line I was able to use as a historical counterpoint to Clay's modern day adventures. That created a strong historical element that I think made for a much better book. BW: I probably did more preparation for this book than I have for any previous attempt at writing fiction. I believe it's the reason I actually finished this one and it worked out as well as it did. Over the years I'd made sporadic attempts at writing a novel or play. I'd get an idea for the project and, overtaken by the rush of enthusiasm, would sit down and start banging way on it, figuring the book would develop as I wrote. That may work for some writers, but inevitably I hit an unforseen problem and couldn't write my way out of it. The end result was a lot of crumpled paper and a piece with a beginning and no end. Age and the experience of having compiled eleven reference books had something to do with a change in my approach, I'm sure. So did the fact that I'd been reading a lot of good detective novels, historical fiction, and suspense novels. 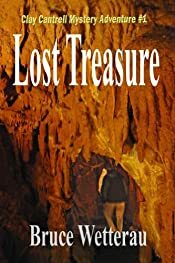 When it came to writing Lost Treasure, I deliberately spent a lot of time thinking about the book, turning over the idea in my mind and just jotting down notes on characters and subplots as new thoughts came to me. At the same time I started researching, reading books on the Civil War and cave exploration, to name two areas. With the major plotlines blocked in, I next wrote a detailed scene-by-scene outline of the whole book. That took some doing, but a lot of unforseen problems got worked out. That's not to say there weren't any inspired additions or new problems that cropped up when writing the manuscript itself. But with the outline done, I could write each scene knowing what had to happen to get my characters to the book's surprise ending. And yes, I started this project with the ending in mind and worked backwards from it. OMN: So … let's assume your book gets optioned for film or television. Who do you see playing the key roles? BW: Now there's a thought that warms my heart. A movie from my first novel! As I wrote Lost Treasure I did have a couple of actors in mind in terms of size and screen presence, but like me, they've gotten older or gone ahead of me to that great movie theater in the sky. If anybody remembers the young Tom Selleck in that long-running series, Magnum PI, that's who provided inspiration for Clay — he's a young good guy with some faults, bigger than average, and very capable of taking care of himself, sort of in the John Wayne mold. Mac is the really big guy — the good natured bear with a strong sense of loyalty to a comrade. Harp in Cornwell's Sharpe series provided the inspiration for him, but I don't know who would play him in a movie. Earnest Borgnine was burly enough that he might have worked in the part, but he's left this earth. I haven't seen it yet, but I'll bet one of the Navy Seals in Zero Dark Thirty would fit the bill. Not to date myself, but Susan is a Natalie Woods kind of girl, a classic dark-haired beauty. The sexuality is there, but in a quieter, nice girl way. For Clay's friend Jimmy, I think of Tom Hanks as a good fit (he even played a school teacher turned infantry officer in Saving Private Ryan). OMN: Speaking of movies, what are your favorite films? Did they contribute to your book? BW: Jeez, there are so many. It's like opening a box of chocolates. Which one do you eat first? For pure richness of story and superb acting, I'd have to pick the three Bogart classics, Casablanca, African Queen, and Maltese Falcon as my all time favorites. For a more modern gritty reality, I like Eastwood's Dirty Harry movies, but it was one of his later movies that really grabbed me — Absolute Power. I just love the premise — a jewel thief trapped in the middle of a burglary witnesses a murder involving the president. I mean what do you do? And it only gets more tangled from there. I like action movies, and up to a point elements of that genre will always find a way into my books. But I also have a definite weak spot for more cerebral sleuthing stories, like the BBC Inspector Morse and Foyle's War TV series, and Hitchcock's really excellent suspense movies. To my mind The DaVinci Code and the two National Treasure movies offered up a really nice blend of intriguing premise, adventure, and mystery. If I had to pick one movie that inspired me most in writing Lost Treasure, I suppose it would be one or the other of the "National Treasure" movies. OMN: What can you tell us about the next book in the series? BW: I've already started work on Killer Fog, the second Clay Cantrell mystery adventure. The book will have the same set up, alternating between Clay's modern day adventures and an entwined historical plotline, this time centered on the World War II years. I want to keep a strong element of historical fiction in each book of the series, and yes, I do plan to come back to the Civil War in a later book. Bruce Wetterau, a former free-lance editor and author of eleven reference books, has been buying and renovating old houses in Virginia for over a decade. He lives in Staunton, Virginia, where he writes, pursues his hobbies of hiking and landscape photography, and continues to work on houses. Suppose you suddenly found yourself holding the key to finding a lost Civil War treasure worth millions. You'd think that would be a stroke of good luck, wouldn't you? But that's not the way it plays out for contractor Clay Cantrell, an ex-Army Ranger. Soon after his stroke of good luck, he finds himself snared in a web of murder and drugs, even as he and his partners pursue a treasure they can only gamble is really there. Set in Virginia's picturesque Shenandoah Valley and the Allegheny mountains to the west, Lost Treasure is a tale of three intertwined mysteries and a truck load of adventure. There's the mystery of how, during the Civil War, a Confederate Army captain may have buried the horde of gold coins — along with all the men under his command — in a cave somewhere up on Jack Mountain. Then there's the mystery of who, in modern times, is trying to set up Clay for a murder he didn't commit. And, just for good measure, there's the mystery of how Clay and his partners are going to find the treasure — supposedly somewhere deep inside that cavern in the Allegheny Mountains — if in fact it really exists. Read an excerpt from Chapter 2, below. Waiting at a long stop light, Jimmy flip-flopped between the certainty he'd find proof the gold was still there, and the black depression that it was long gone. "Nine million bucks. Three million each. Man, what I could do with all that money!" he said out loud. A minute later he pulled into the crowded parking lot at Phil's Restaurant, a popular breakfast spot, and saw Clay's Sting Ray parked toward the back. As Jimmy pulled into an empty spot along-side the Vette, Clay rolled down his window. "My ride or yours?" "Let's take yours," Jimmy said grinning with boyish enthusiasm. "I've never ridden in a Sting Ray before." The Vette, with its liftoff hardtop on, was a sculptured beauty, low, sleek, and powerful. The chrome and dark, midnight blue paint job shone in the morning light, looking like the car had just rolled off the assembly line. Jimmy about salivated at the powerful, throaty rumble as Clay started up her big V-8. Jimmy slid into the low-slung black leather bucket seat, the leather, cooled by the car's AC, felt supple and smooth. "Waynesboro Library, coming right up," Clay announced as he backed out of the spot and pulled onto the highway. "Man this is a beauty," Jimmy said appreciatively. "When did you get it? Until the other day, I don't think I've ever seen you in anything but your pick up." "Got it about a year ago. Friend of mine from the Army offered me a deal I just couldn't refuse." "I don't blame you. What year is it?" "Sixty-seven. It's got the big block 427 with the triple Holley two-barrel carb. The engine's what they nicknamed the 'Tri-Power 427' and the '67 is the one everybody wants." "Power, man. It's got real guts off the line." Clay turned onto a two-lane back road leading to Richmond Road, which they would take to Waynesboro. With nobody in front of him and still in second gear, he hit the gas. The big V-8 roared as the rear tires chirped and dug in. Jimmy felt like he'd been slammed back into the seat, and in the blink of an eye they went from 20 to 50 mph. With a curve coming up, Clay tapped the brakes and the Sting Ray obediently came back to a mild mannered 25. "Kind of a kick, isn't it?" "Awesome," Jimmy said with a big Cheshire cat grin. "I'm going to add one of these to my garage when we find the gold." Clay laughed. "You think it's really there?" "I sure hope so. That much money would be a real life changer." "Yeah, I guess. You could definitely buy a lot of stuff. You could even quit your job. But then what would you do?" "Haven't got that far yet," Jimmy answered, laughing almost gleefully. "I like teaching history. Maybe I'd keep on with it, and do other things as well. How about you? What will you do with the money?" Clay looked over at Jimmy and smiled. "Well, we still don't know it's there. I mean a lot could have happened in 150 years. We probably shouldn't get ahead of ourselves on this." He was right of course, which stung Jimmy a bit. "Yeah, I see your point, but it's kind of fun to think about it. No harm in that, is there?" "No, not at all. Like you said, it would be a life changer." "Maybe not for you though, Clay." "What? You mean because of my parents?" "That's their money, Jimmy, not mine. Sure, I've had some breaks because of it, and from time to time took some crap for having rich parents. But they raised me to stand on my own two feet and make my own way. And that's pretty much what's been happening. "I'll tell you something funny, though. I've been driving myself really hard the past five years, building the business with Mac. Pushing hard to make a go of it. Not having much of a life outside of work. A lot of that comes with being in business for yourself, especially when you're starting out. You can't just drive home and forget about it for the weekend, ‘cause it might not be there next week. "I've been thinking though, maybe there was more to it than that. My dad came up with the seed money we needed to get C&H Construction up and running — flat out gave me a ton of money. He just said 'Thank you for what you did in Afghanistan.' Funny thing was, I never felt like I was doing anything more than anybody else. We all risked our necks on the missions, but most times we were either bored stiff or having a good time. "Believe it or not, I felt like I didn't deserve that money, I suppose because I hadn't worked for it. That only drove me harder, to feel like I deserved it, and to make damn sure I didn't lose it." "I suppose I'm going to feel like that," Jimmy said, "if we hit pay dirt." "Maybe. You just don't want to fall into the "easy come, easy go" trap. That happens too. I knew a guy who inherited a million bucks and blew it all in about five years, a good chunk of it up his nose. Maybe that's the real gift my father gave me. He taught me to take care of money, respect what it can do, and what it can do to you." "And here we are at the moment of truth," Jimmy said idly as Clay pulled his Sting Ray into the Waynesboro Library parking lot. Walking into the library with Clay, Jimmy's stomach roiled with the flip-flopping again. Yes they'd find the answer; no — black, gloomy no — the gold was long gone. He couldn't help it. At the main desk, Jimmy signed them in for the Local History Room. He tried taking deep breaths to calm himself as they followed the young librarian to the room where the volumes of War of the Rebellion: A Compilation of Official Records were kept under lock and key. While she fiddled with the keys to the door, the flip-flopping almost overwhelmed Jimmy, until he glanced at Clay, who stood there looking solid and unmoved. That's when Jimmy decided to get a grip, reminding himself that he'd never know the answer until he actually looked in the Official Records. The librarian turned on the overhead florescent lights revealing a room lined floor to ceiling with shelves heavy with dark-covered old books. She pointed them to the far wall and then left, closing the door behind her. At last, Jimmy thought, standing there in front of a whole wall of books devoted to just the Official Records. It was an imposing sight indeed, a memorial of sorts to the machinations and maiming of two great armies. Each volume ran to over three inches thick, with faded dark green covers and a thousand pages or so, those pages slowly turning a pale brown with age and the ravages of the sulfur in the paper. Turning to Clay, Jimmy said, "This is it. There's got to be an answer in there somewhere." "If you say so …"
"There's two basic parts, if I remember correctly. The first is strictly military records, battle reports, command papers, that kind of thing. The other has papers dealing with military-civilian issues." Jimmy reached over and pulled two volumes off the shelf. "These are the indexes to the two parts. Why don't you check the military-civilian records, while I look in the military records index? "Try any variation of Depot 21 you can think of. And Capt. Burns, or Col. Gideon Spencer," Jimmy said as they sat down at the long oak table in the center of the room. While Jimmy leafed impatiently back and forth in his big index volume, Clay turned pages idly, at first not really looking at the index entries, but just taking in the brittle, browning paper, the slightly acrid smell, and the thousands of names listed in column after column, page after page of this thick tome. Finally getting down to business, he tried Jimmy's suggestion of looking up variations of the depot's name. Supply Depot 21, Depot 21, 22nd Virginia Supply Depot 21, and so on. Nothing turned up. Jimmy found some entries for Capt. Chandler Burns, but when he went to appropriate volume, he found only reports from when Burns was stationed in Richmond and Staunton. Nothing for Depot 21, and nothing after. Back at the index again, Jimmy suggested they both try Col. Gideon Spencer. "Just dead ends," Jimmy announced after checking out several index entries. "How about you?" Clay had been sitting there watching Jimmy work furiously back and forth between his index and the volumes, expecting his friend would have a better shot at hitting the answer than he. Prodded by Jimmy's "How about you," Clay turned to the S's. "Hey, I've got one. January 1865. Volume 86, page 689."